The four symbols associated with Judeo-Christianity are; the Menorah, the Star of David, the Fish and the Cross have a holy origin. Every time we see this “Messianic Seal” our eyes are focused immediately on the middle – the “Star of David!” In the “Fish” we see the Bride of Christ as one body, Jew and Gentile and in the “Menorah” the glorious light that shines from the throne of Almighty God. The dominant, centuries old, Christian influence on the English language, “God” has always been understood as the supernatural Creator described in detail throughout the entire Bible, which Christianity has traditionally viewed as “God the Father.” Jews refer to this Divine being as either “Adonai” or “HaShem” (the Name) or sometimes in a more casual manner by the unique designation “G-d.” Because, of the traditionally devout Jewish reverence for the name of God, a great many practicing Jews (Orthodox) will try to show their continuing respect for the God of the Old Testament with the humble combination of letters with a hyphen seen as “G-d.” Make no mistake about it, the only reason the English language spells “Jew” – “Judaism” and “Judeo” is to indicate a belief and adherence to “God” alone, rather than any other, non-biblical “god.” Yes, there are frequent references to other supernatural entities and deities, which the authors of the Bible usually always identified as false “gods” not worthy enough to ever be spelled with a capital “G” let alone worshiped and prayed to. Thus, the primary understanding remains the same in that God, by definition, can only mean the God of Judaism and the God of Christianity …and no other, not even Islam! Why…? Well, the only historical word for their “god” used by Muslims is Allah, not the LORD or GOD, while Jews who lived in English-speaking nations have at least sometimes used the same designation as the English-speaking Gentile majority. Indeed, English-speaking Judaism understood quite well that they most certainly did not worship any god at all, but only God (of the Bible). 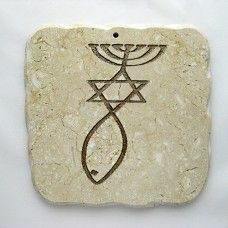 The Messianic symbol as stated combines the “menorah” of the Jews and the “fish” symbol of the Christians with base stand of the menorah and the tail of the fish connected. The menorah has been one of the most revered objects of the Hebrews and its image today is symbolic of the Holy Temple (Exodus 25:31-37) and with it comes the message of hope and salvation. With the number seven imbedded in its imagery, it depicted the number of “perfection” and its seven branches depicting the “Tree of Life” lit with the oil of the Ruach HaKodesh (Holy Spirit). This lampstand also depicted the hope of restoring that ‘Tree’ in the Garden of Eden in the future New Jerusalem (Yerushalayim) as noted by the prophets of old. 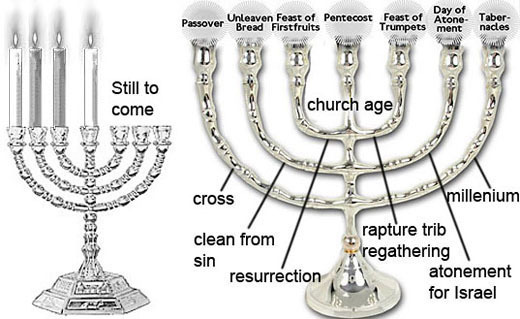 In the “Menorah” as believers in Yeshua (Jesus) we can see a prophetic picture connected to the Feasts of the Lord. “I saw seven gold menorahs; and among the menorahs was someone like a Son of Man, wearing a robe down to his feet and a gold band around his chest. His head and hair were as white as snow-white wool, his eyes like a fiery flame, his feet like burnished brass refined in a furnace, and his voice like the sound of rushing waters. In his right hand he held seven stars, out of his mouth went a sharp double-edged sword, and his face was like the sun shining in full strength,” Revelation 1:12-16. The Menorah reflects… the LIGHT emanating from the seven individual candlesticks. The ineffable Glory of the Father, the Son and the Holy Spirit, the same light that made Moses’ face to glow (Exodus 34:35). It reflects God’s land and nation of Israel. In the centre stem, the Body of Messianic Jewish believers, that even today survive as a divinely chosen remnant with an appointed purpose (Isaiah 2:2-5; 11:10; 49:6; Micah 4:1-2; Matthew 28:19; John 12:32; Acts 13:47) that will continue until Yeshua (Jesus) once again reigns as King from the “throne of David” on Mount Zion, together with the 144,000 Messianic Jews and true believers of the church. The seven candlesticks represent the many branches and divisions within the many branches …and divisions within both the Gentile Christian Church as well as the Messianic believers as well as the tree of life from the Garden of Eden. Then there will be peace in Israel and throughout the world (Isaiah 11:6). 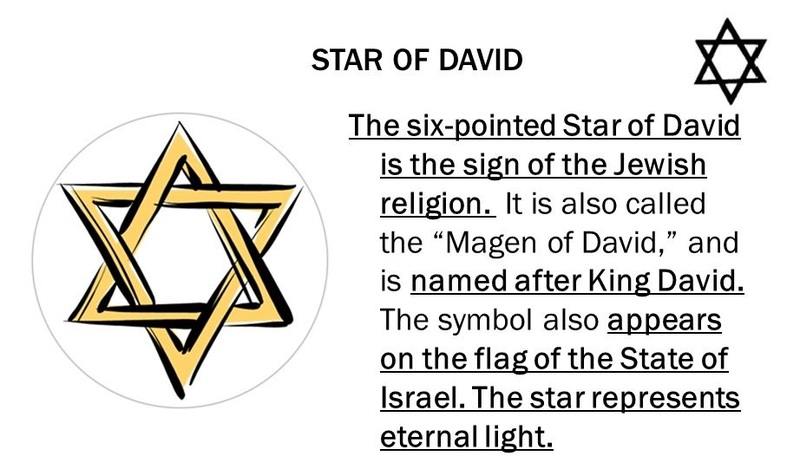 The Star of David… is a six pointed star that forms the centre of “the Messianic seal” makes it evident that this ancient Jewish symbol was in use for religious purposes at least for five centuries earlier than is commonly known. Firstly, we need to debunk theories that this star was occult however this cannot be so as the “Star of David” always has a top and bottom point lined up vertically and the star that is used in occult rituals is rotated so that the two side points line up horizontally. Interestingly, the “Star of David” contains a total of twenty-four points or sides if the sides or points of all six triangles, plus the six sides or points of the centre are counted (6 X 3) + 6 = 24. If all those would-be hate and fear mongers out there who view the Star of David as evil were being honest …they would and should count all twenty-four of its sides! Even more interestingly, in Revelation’s vision of God’s throne in Heaven, it is surrounded by twenty-four elders and four six-winged Cherubim representing six ages of time (Revelation 4:4-8). Could it therefore be that the “Star of David” is also an allegorical emblem for God’s throne…? Now, here’s something we all could think about! The use of the six pointed star as a symbol of Judaism, the Jewish people and the State of Israel and its Biblical early king, King David, has its roots in the ancient Jewish alphabet in use before and during the time of King David. In this early alphabet the letter "Dalet" or "D" was shaped as a triangle. Therefore, an ancient triangular shaped "Dalet" was used at both the beginning and the end of the name; DAVID. When the pagan nations went to war, they many times painted fearsome dragons, snakes or creatures on their soldiers shields… but the Israelites chose instead to use the "Star of David" the two interlaced, equilateral triangles (dalets) which were both first and last letters of their KING DAVID’s name! Since King David had a well-deserved reputation as "a man of war," and this proved to be an excellent and effective symbol for warfare. Other traditional religious belief is that The "Star of David" is said to have one triangle of the star pointing "downwards" (God reaching man) and the other triangle "upwards" (man reaching towards God). The "Star of David" is also said to represent the six attributes of God; power, wisdom, love, majesty, mercy and justice… representing the God of Abraham, Isaac and Jacob, Himself! Another belief is that the six points of the "Star of David" signify the six days of Creation (Genesis 1) and that the centre of the star represents the 7th day or Sabbath rest! In the Bible we have substantial scriptural support of the "Star of David" connected to prophecy… ‘There shall come "A star" out of Jacob, and a Sceptre out of Israel" Numbers 24:17. Yeshua (Jesus) Himself said, "I am the root and offspring of David, the bright morning star," Revelation 22:16. After Yeshua’s birth in Bethlehem the Magi arrived from the east in Jerusalem saying, "Where is He who has been born "king of the Jews? For we saw the star in the east, and have come to worship Him" Matthew 2:2. They saw the glory of King Yeshua (Jesus) in the "morning star" – the offspring and Star of David! The Star a symbol of Yeshua. Even in Judaism they understand that the star alluded to in Numbers 24:17 to be the Messiah! Joseph is commonly seen as a "type" of Yeshua (Jesus). In His dream, as recorded in Genesis 37:9 the eleven "stars" were the eleven brothers of Joseph, while the sun and moon represents Joseph’s father and mother. This dream is a prophecy and is fulfilled in Genesis 42:6 …and four times following this. Those eleven brothers bowed down to their brother Joseph just as he had dreamed! Today the "Magen David" (Star or Shield of David) is very embodied in Zionism. It is found in every synagogue and it flies proudly as a modern day "Star of David" on the Israeli flag. It is still a very sacred symbol and young Jewish adults receive this charm at Bar/Bat Mitzvah’s and also as jewellery worn proudly by Israeli’s, on the nations ambulances …and even non-Jews who stand with Israel wear it. The “Seal of the Fish” … Scripture records two different occasions where Yeshua (Jesus) miraculously multiplied bread and fish in order to feed the crowds that followed Him (Matthew 14:17-21; 15:34-38). It is understood that the “fish” in these instances represents “believers in Yeshua” (collectively the church) and can be viewed as miraculous multiplication and in each case of potential church growth. Interestingly, “dagah” the Hebrew feminine form of the word “fish” also translated as “to multiply, increase or grow!” A parallel is suggested comparing “good fish” and “bad fish” (Matthew 13:47-48), with “good” and “evil” men both species of which are caught in nets, then separated. Here again the “fish” are compared to people (believers and non-believers). The believers having been “fished” out from the net to constitute the “Body of Yeshua (the church).” The “fish” is also a symbol of baptism, since a fish is at home in the water. Related Bible Verse; "As Jesus walked beside the Sea of Galilee, he saw Simon and his brother Andrew casting a net into the lake, for they were fishermen. 'Come, follow me,' Jesus said, 'and I will make you fishers of men.' At once they left their nets and followed him," Mark 1:16-18. The Church therefore comprised of baptised believers (individually and collectively) and is the “bride” eagerly waiting for her “bridegroom” - Yeshua (Jesus). Interestingly to note is that Jewish brides are immersed in a “mikvah” (symbolic to Christian water baptism) as an act of purification just before their wedding ceremonies. Yeshua (Jesus) is therefore scripturally established as the head of the church which is symbolized by the “fish” (Ephesians 1:22-23; 5:23; Colossians 1:18). From another perspective, Yeshua is present within each believer, and therefore through us and with us and within the church. The first known written record of the fish as a Christian symbol was made by Clement of Alexandria in about 150 AD, when he suggested to all his readers that they would be well served to include the “sign of a fish” in their personal seals. However, we know from any sources that the symbolic sign of the fish was familiar to the first believers of the 1st and 2nd Century. It is most interesting that the “eight artefacts containing the Messianic Seal” each with the” fish” as one its three component symbols, have also been dated back to the very beginning of the 2nd Century. It seems obvious that the “fish” was first used as a symbol by the Messianic Synagogue on Mount Zion who spoke predominantly Hebrew – not as an individual symbol but as an integral part of a three-part symbol whose total meaning was considerably different and more than the fish alone. Sadly, when we refer back to the time when the Nazarenes who had the Gospel according to the Hebrews were forcibly ejected from Israel by other Jews and the Gentile Christian Church, and considering as well the ongoing intense campaign by this same Christian Church to cleanse itself from anything Jewish, it would also seem that the “fish” was separated from the other two very Jewish (Menorah and Star of David) elements before it was, by itself, transported to Rome! Even so it was very likely that the “fish” symbol was used by itself as a sign by which early Gentile believers found and identified one another especially in times of persecution, such as in Rome when the early believers had to hide in the catacombs, before Constantine’s conversion. The “fish” would not be an obvious Christian symbol to persecutors; It is said that during the persecution of the early church, a Christian meeting someone new would draw a single arc in the sand. If the other person was a Christian, he or she would complete the drawing of a fish with a second arc or dot the eye. If the second person was not a Christian, the uncertainty of the half-symbol would not reveal the first person as a Christian. The Symbol of the “Tav” or “Taw” in the eye of the “fish” …. 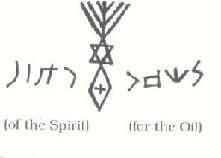 is really a symbol within a symbol and is very significant indeed and was probably used by the Essenes as a sign meaning “salvation” and the Messianic Seal of the Jewish Nazarenes. At the base of the seal is an engraving that looks like the ‘Tav’, the last letter of the Hebrew alphabet. The “Tav” was an equal armed cross written upright like (+) or sideways (x). It has been found in early Semitic inscription at the Sinai Peninsula and also is known in various scripts besides modern Hebrew to include, archaic Hebrew, Canaanite, Phoenician and Aramaic. After the exile, the square letter “Assyrian” script was used in Hebrew but the archaic Hebrew was never abandoned and appeared on Judean coins during era of nationalistic revivals as late as 132 BCE. This sign can be found on burials or graves on the Mount of Olives in first century Judaism. The Nazarenes by putting a “Tav” as it was written in those days as a “cross” they were affirming the “fish” as a symbol of Yeshua. In the midst of the Jewish area of “mikvah” baths, the earliest followers of Yeshua (Jesus) were not only baptized in flowing water but were also baptized by the Holy Spirit (Ruach HaKodesh). Within these same rites of baptism (healing of the soul) and prayer for the sick (healing of the body) was the ritual anointing with olive oil of the sick, the infirmed and the new convert to the family of Jesus. The “Aleph and Tav” (Alpha and Omega) …. Yeshua (Jesus) said (in Hebrew not Greek), “I am the Alpha (Aleph) and the Omega (Tav), the Beginning and the End, the First and the Last,” Revelation 22:13. The Messianic Seal contains yet another indication clearly of both the “Aleph” and the “Tav” a symbolic representation of the Messiah, Yeshua, Himself. Scripture abounds with the concept established by our Lord; First to the Jew and then to the Gentile (Romans 1:16; Matthew 4:23-25). Yeshua was first the Jewish Messiah, even though He was mostly rejected by those whom He was first given …hence, His later presentation by the Apostle Paul to the Gentiles in order to make the Jews jealous (Romans 11:11). The Messianic Seal that was first given as a divine inspiration to the distinctively Jewish Synagogue on Mount Zion, has re-emerged after nearly two thousand years of suppression, only once again to be given “first to the Jews” …the contemporary Messianic Jewish Body in Israel …and only then to the Gentile Christian Church, and world beyond. Christians around the world are seeking to know more about their Hebraic Roots and connecting with their Messianic Jewish brothers and sisters to form a One-New-Man together (Ephesians 2:14-18). The three-part symbol linked together is called the “Messianic Seal”- Menorah, Star of David and Fish… consists of a menorah at the top, a star of David in the middle, and a fish at the bottom. The star is created within each of the renditions of the three-part symbol by interlacing the menorah stand with the fish's tail. The Seal of the Cross… Early Christian churches were often built in the shape of an octagon (eight sided) in order to reflect that Messiah, who resurrected from the dead, did so on the eight day (Sunday, the first day of the week plus the seven days of the previous week 1+7=8). This emphasis on the number eight was to teach the correlation between the resurrected Messiah and redemption. David, the eighth son of Jesse, brought a new era to the children of Israel and the Messiah / Redeemer will do this same thing but even in a greater way in the last days; therefore, the Messiah Yeshua (Jesus) is called the son of David. David was the eighth son of Jesse. This fact fits nicely with the Hebraic significance of the number eight. The number eight has theological significance of “newness” and /or “redemption.” From where is this derived…? There were eight individuals who lived through the flood, Noah and his three sons and their wives (I Peter 3:20). God re-established the human race a new after the flood through these eight people. Also a Jewish boy under the Torah law (Old Testament) is circumcised on the eighth day and brought into a “new” relationship with the people of Israel. The idea of “newness” is so emphasized that the son does not even receive a name until he is circumcised reflecting this new identity which he received on the eighth day. Genealogies were therefore important and used to convey a theological message rather than an absolute fact. Therefore, the writer of 1 Chronicles 2:13-15 chose to list David as the seventh son in order to speak to the fact that David was sanctified (set apart with a purpose) to be the son of Jesse who would be king. The Chronicle passage is not ignorant of the fact that David is actually the eighth son of Jesse, but prefers to list him as the seventh son. The number seven carries a meaning of "set apart" or "sanctified." Some scholars suggest that perhaps one of David's brothers had died and now David was in fact the youngest of seven remaining sons of Jesse. Yeshua (Jesus) the Nazarene’s of the first church promised Messiah and ours too! They founded their Messianic Synagogue directly upon the tomb of David, in Jerusalem, symbolized as “the Star of David.” They were the first born-again believers on Pentecost, saved individually by Yeshua’s sacrifice on the cross, further testifying that they have Yeshua dwelling within them. Individually their salvation through the cross is symbolized by the “Tav” or “Taw” rendered as the “eye of the fish!” Yeshua is symbolized by the “fish” and Himself, claims to be the “root” and so we see in the “Messianic Seal” that the “fish” is at the bottom of the “Seal” where He as the “Head” of the body, the body itself symbolically “rooted” with the Church thus formed on a Biblically strong foundation! Light stemming from the Menorah at the very top of the “Seal” symbolizing the unspeakable “glory of YHWH (Yahweh) – God,” which is the light of Yeshua! Our Lord is also symbolized by the combined presence of “Aleph” at each point of the “Tav” or “Taw” in the eye of the “fish” and the double “D” of David! The New Testament tells us that Yeshua (Jesus) came into the world as God’s Son and set about to prove that His origin was in heaven, not in Bethlehem. When He was about to raise Lazarus from the dead, He prayed and included these words in His prayer; “that they might know that You sent Me,” John 11:42. By this He meant that He was from above, and they were from below. Or, in debating with the religious leaders Yeshua asked how David could call his descendant his “Lord,” clearly showing that the “Son of David,” the Messiah, was greater than David (Mark 12:35-36), regarding Psalm 110. And of course, to the woman at the well Yeshua clearly revealed Himself: she said, “When the Messiah comes, He will declare all things to us.” Yeshua (Jesus) said, “I that speak to you am He,” John 4:25-26. It is clear, then, that Yeshua claimed to be the Messiah, the Christ, the child born into the house of David, the Son given by God to be the long expected King. The first advent of Yeshua (Jesus) established His identity; it did not begin His reign, however …for He has yet to put down all enemies! The prophecy that “the government will be upon His shoulder” will come to complete reality at His Second Coming … an aspect of the Messianic prophecies that the prophets did not see (1 Peter 1:10-11). The reference to the “shoulder” is probably a reference to the wearing of an insignia of office on the shoulder (Isaiah 22:22). There will be a time when this Son will rule as king. We may say that Yeshua (Jesus) now reigns above, and that is certainly true …but Isaiah envisions a time of universal peace and righteousness in this world. That has not happened yet! Hebrews 1, states that this exaltation will be complete when the Father again brings His firstborn into the world. So Isaiah does not know when all these things will take place …only that they will happen because the Word of the LORD has declared it!